The National Basketball Association popularly known as NBA is rated as the best in the world. NBA players are also among the best paid athletes in the world. The NBA was founded in 1946. In this post we are going to take a look at some of the top 10 best Nigerian basketballers that has ever played in the NBA. 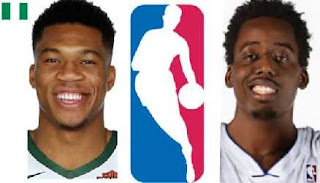 Ever since the NBA was founded 72 years ago,about 23 basketballers with Nigerian origin has played in the NBA since 1946. 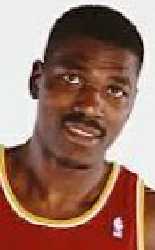 Hakeem Olajuwon was born Hakeem Abdul Olajuwon in Lagos back in 1963. The Nigerian American is rated as one of the greatest basketballer with Nigerian roots to feature in the NBA. He was nicknamed ''The Dream'' by his college coach who thought that he made slam dunking look so easy like a dream. However Hakeem never played for Nigeria,he won a gold medal with the United States at the 1996 Olympics in Atlanta USA. He was in the NBA for 20 years and played 1238 games. His awards and honors in the NBA include NBA's Top 50,MVP, 2x Finals MVP, 6x All-NBA 1st, 2x DPOY, 5x All-NBA Defensive 1st,Hall of Fame Player,12x All-Star. His jersey number 34 was retired by the Houston Rockets. Hakeem has long retired from professional basketball. Giannis Antetokounmpo is a Nigerian basketball player that was born in Athens,Attica Greece in 1994. His father was from the Yoruba tribe while his mother is from the Igbo tribe in Nigeria. His name,originally Adetokunbo became Antetokounmpo after it was misspelled in his Greek passport. His good ball-handling skills earned him the nickname the "Greek Fre*ak". Back then as other immigrants Antetokounmpo and his older brother Thanasis assisted their family by selling items such as watches,bags and sunglasses on the street. In 2018 he reportedly earned about $21 Million Dollars. Antetokounmpo is the first player in NBA history to ever finish a regular season in the top 20 in total points, rebounds,assists,steals and blocks. He still plays professional basketball in the NBA. Some of his awards include MIP,3x All-Star,All-NBA Second Team,Player Of The Month,Player Of The Week,All-Rookie Second Team. Al-Farouq Ajiede Aminu was born in Atlanta,Georgia back in 1990. He plays his professional basketball in the NBA. Farouq also plays internationally with the Nigeria national basketball team D'Tigers. He won the 2015 FIBA Africa Championship (AfroBasket) in Tunisia with Nigeria's D'Tigers and also competed at the 2012 Summer Olympics with the Nigerian basketball team. He was also named in the All-Star Five of the 2015 Afrobasket that Nigeria D'Tigers won. Ikechukwu Somtochukwu Diogu was born in Buffalo,New York in 1983. Ike Diogu played with the Nigerian national basketball team,he took part in the 2012 & 2016 Summer Olympic Games. He was the MVP of the 2017 FIBA Afrobasket tournament. He spent 7 years in the NBA before moving to China to continue his professional basketball career. Ime Udoka was a former professional basketball player in the NBA. He played for the San Antonio Spurs of the National Basketball Association (NBA). He was born in Portland,Oregon back in 1977,currently he is the assistant coach for the San Antonio Spurs in the NBA. Udoka also played for the Nigeria national basketball team.His father is from Akwa Ibom state in Nigeria while his mother is an American. Udoka's older sister named Mfon was once a player in the WNBA. Obinna Ekezie was born Obinna Ralph Ekezie in 1975. He played in the NBA and other leagues. The retired professional player hails from Obor Autonomous Community in Orlu Urban Local Government Area of Imo State. He is rated as one of the best Nigerian basketball players to have ever featured in the NBA. He is the founder of Wakanow and ZeepTravel which is an online business that provide travel services. Kelenna Azubuike was born in London in 1983. He was raised in Tulsa,Oklahoma USA. He was a former professional basketball player in the NBA for six years. Josh Okogie is a professional basketball player in the NBA. He was born Joshua Aloiye Okogie in 1998 in Lagos, Nigeria. He is ranked as one of the best Nigerian basketballers in the NBA. Chimezie Metu was born Chimezie Chukwudum Metu in 1997. He was born in Los Angeles. The professional basketballer moved to Nigeria with his father when he was 6 years old,however he returned to America when he turned 12. He currently plays in the NBA. Michael Olowokandi is a Nigerian born former professional basketball player in the NBA. He was born in 1975 in Lagos Nigeria. Michael was raised in London,he was the number one pick in the 1998 NBA draft. He played professionally for the Angeles Clippers in the NBA before he retired. Some Nigerians are really making it at the bigger stage.